While these potatoes are fried, the arugula and vinaigrette add a lot of fresh flavor. This recipe doesn't require a lot of oil, making it a healthier alternative for french fries. 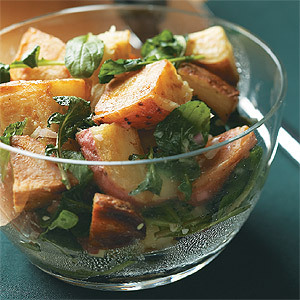 For optimum flavor, toss the fried potatoes in the vinaigrette while they’re hot. Boil potatoes in a saucepan of water over high heat until tender, 8 minutes. Drain, rinse, and spread on a baking sheet; chill until cold. Whisk together 3 Tbsp. oil, shallots, vinegar, Dijon, sugar, salt, and pepper in a large bowl until combined. Sauté chilled potatoes in 1 Tbsp. oil a cast-iron skillet over medium heat in 1 layer until browned on 1 side, about 10 minutes. Stir potatoes and continue to brown until crisp, 10–15 minutes more. Toss warm potatoes with vinaigrette and arugula until coated.